Megan grew up in Georgetown, KY and gained a lifelong love for dinosaurs and paleontology after watching Jurassic Park when she was three years old. She graduated from Centre College in Danville, KY with degrees in biology and music. While at Centre, she worked with his Dinosaur Discovery Adventures and The Collective Collection (thecollectivecollection.org), designing and creating museum fossil experiences for the public in museum galleries as well as in the field.. After college, Megan worked for a year as a preparator in the Dinosphere lab at the Children’s Museum of Indianapolis. She recently graduated from the University of Kansas with a master’s in Museum Studies and Paleontology and was an intern for the Denver Museum of Nature and Science’s Snowmastodon Project. 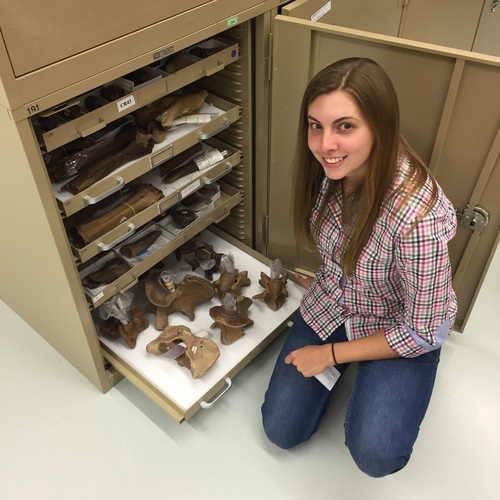 Currently, Megan works for the Bureau of Land Management managing the federal vertebrate fossil collections at the University of Kansas. When she’s not digging for dinosaurs, Megan loves playing music and indulging her unrequited aspiration to be a film major by watching too much TV. This summer, Megan is looking forward to spending time in states she’s never been to, digging in the Hell Creek Formation for the first time, and meeting new people.